Graphic conversion from your EPS, AI, PDF or DWG files. Functions on all mobile devices, tablets and PCs. Memory. Selected options that change the footprint are shown an all levels affected by that option. Dynamic options menu with parent/child relationships. Can you afford to negotiate on price alone? Todays consumers will conduct thorough research online before they sign a contract with you, or even contact you. Where does that leave you? Can you show what makes you different and better than your competition online? As much as they are buying the neighborhood and the community, they are buying their home. They will want it to be unique to their tastes. 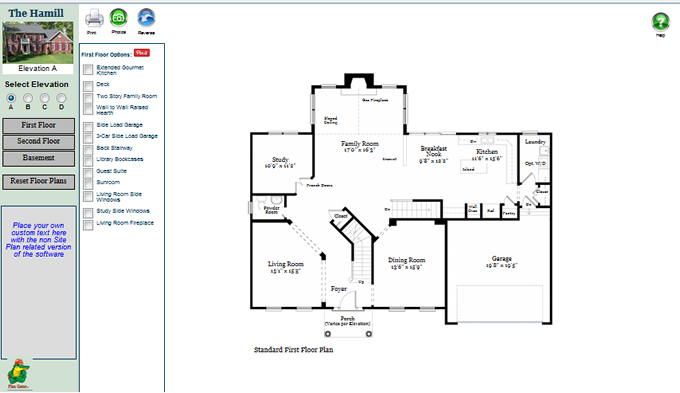 Interactive floor plans give your consumers an easy method to visualize the different ways they can personalize their new home on their time, without pressure. Give them as much information online as practical and position your sales people to challenge what your competitor is offering. This is a win-win scenario as options create desire, a higher sale and usually at a higher margin....not to mention the sale itself. Interactive floor plans are not just for the consumer as your company will realize benefits in other areas, all which will reduce errors and lead to more a efficient sales and production process. And like your homes, interactive floor plans are not all the same. While all give your consumers an opportunity to explore the structural options, that is where the similarity ends. Plan Gator is unique as we do not force you to use a generic template or to use your vendor's external servers to link interactive floor plans on your site. We create custom templates that integrate seamlessly into your website's styling. Our IFP's function using databases. This creates many opportunities unique to Plan Gator as we are able to integrate the IFP database into yours, giving your team complete control of the IFPs. No need to worry if a third party "unplugs" you for any reason. This integration also opens up opportunities to link your floorplans to your site plans via a GUI that we develop especially for you. You can take this one step further by employing our Interactive Sales Agent. Keep everyone on the same page throughout your organziation by include an image of the floorplan listing structural options in the start package, calculate sales prices and costs of options, create as many analytics as you desire to display on your dashboard. Of course if you wish to use our servers, the Gator will accommondate your wishes. We have a 99.9% uptime history. Another Gator idea is to put to use all those photos of the interiors of your homes by embedding them into the interactive floor plan. We use a button to enable photos that display icons (yours or ours) to indicate on the plan where the image was shot from. Taking this one step forward, images of options will attach themselves to the options. In the Hamill demo above, a click on the camera icon will show the standard kitchen, if you select the optional Gourmet Kitchen from the options menu and then re-click the same icon, you will notice that the image now shows the optional kitchen. Our research shows interactive floor plans increase sales, increase profits, decrease expenses, and reduce errors. What are you waiting for?